flattened by Allied bombing in 1945, it resumed the planning and rebuilding process as it coped with rapid population growth (now 3.5 million) and a shifting industrial base. 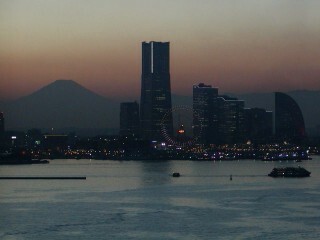 The structures in this photograph are part of its most recent effort to design a livable, vital city: Minato Mirai 21. Built on the site of a shipyard formerly located on the seaward side of Yokohama Station, this new development is anchored by Landmark Tower, Japan’s tallest building. A complex of office buildings, hotels, museums, hospitals, concert and convention facilities, and residential towers, Minato Mirai has been planned to revitalize the Yokohama experience by connecting the old city center (Sakuragi-cho, Kannai) with the booming commercial area that has grown up since 1956 around Yokohama Station, and incorporating thrilling views of the harbor and Tokyo Bay from every angle. It’s working! Minato Mirai, like much of downtown Yokohama, is built on reclaimed land and is flat as can be. The Word Works is located slightly inland, on a steep bluff above Yokohama Station. Yes, that’s Mt. Fuji in the photograph. On a clear day, we can see it from the office, too.